Author: Mauro Tosco. Series edited by: Hans-Jürgen Sasse †. 10 pp. Roman, 304 pp. The Southern Somali dialect known as Af Tunni (Speech of the Tunni) is spoken in the interrivine region of Somalia by members of the Tunni clan. Af Tunni is very different from the official Somali language, and has been tentatively classified within the Digil group of dialects. It is the dialect most influenced by the Southern Somalian koine Maay. The on-going problems in the classification of the Southern Somali dialects are discussed in the introduction. The description – based on fieldwork carried out by the author in the 1980ies – follows a fairly traditional organization. The phonology is presented in terms of a Natural Phonology framework, with exceptionless phonetic processes followed in their turn by morphologically conditional rules. 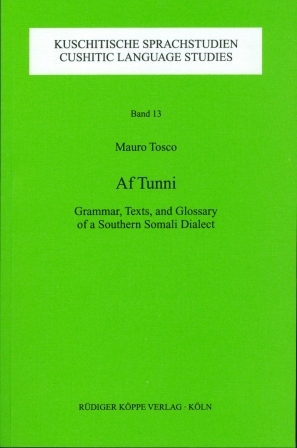 As in other Somali varieties (and Cushitic in general), Af Tunni is a tonal accent language, in which tone is determined primarily morphosyntactically. The following chapters describe in turn the nominal morphology, the verbal system, the particles, and the syntax. The second half of the volume provides an extensive collection of texts, ranging from proverbs and animal fables to a collection of texts describing the material and spiritual culture of the Tunni. Each text is presented in the phonemic transcription, followed by interlinear morphemic translation and a free translation with notes. All words presented in the grammar and the text are given also in a Tunni-English and an English-Tunni glossary. Please find further information on the introduction of the book following the link at the bottom.